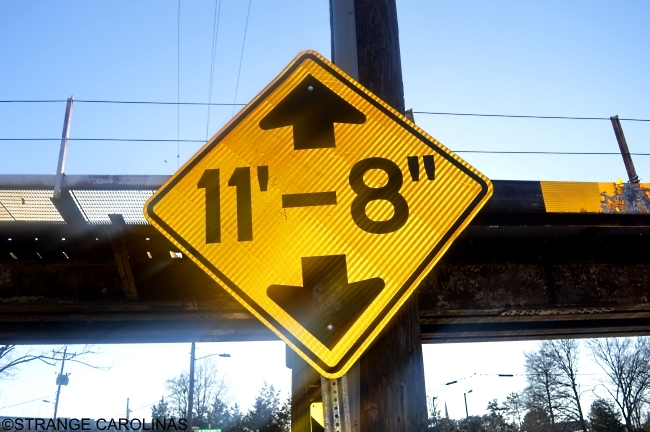 The CanOpener is a Durham railroad trestle bridge that eats trucks. Lucky for us, Jurgen Henn works in a nearby office and is able to film every single crash from multiple angles, which he chronicles at 11foot8.com. We spoke with Mr. Henn about The CanOpener, his thoughts on why it claims so many victims, his favorite crash, and his crash art. I started working at Brightleaf Square in 2002. Over the years, I noticed a pattern of trucks hitting the train trestle on a fairly regular basis right outside my office. In 2008, I decided to investigate a little bit more about how frequent the incidents were and what happens when trucks hit the trestle. At the time, I was in the process of installing a home security system and I used one of those cameras and put it up outside my office to start recording the truck crashes. It took about a month or two before I caught the first crash on video. I decided to put it on YouTube and share it with friends. They were really interested in this footage so I decided to keep the camera rolling and start collecting the footage of these crashes. Why do you think The CanOpener has claimed so many victims? There are a number of factors that contribute to the higher than average frequency of crashes. I want to point out that this is not a unique phenomenon. Bridges, and especially train trestles, all over the world claim victims on a regular basis. This is probably one of the better documented cases and perhaps one of the more reliable cases. We've got a situation here where we've got a two-lane one-way road that has quite heavy traffic at times. It goes through a fairly narrow area with lots of things going on for the drivers to pay attention to. Pedestrian crosswalks, several traffic lights, speed limits, and side streets. There's a fair amount of confusing things to pay attention to. You have a distracted or inexperienced driver and they're paying attention to everything but the one that they should be paying attention to, which is the Clearance Warning. You've got an accident on your hands. They just installed new traffic symbols at the underpass. Do you think this will eliminate or drastically reduce crashes? It's anyone's guess. I'm optimistic. My guess would be we'll see lower speed crashes because the traffic lights on Gregson Street are tied to the sensor. That sensor will trigger the stoplight, but if the driver doesn't pay attention to the clearance signage, they'll still hit the bridge, but probably at a lower speed, which will definitely be an improvement in terms of safety, but it won't eliminate the stupidity factor. What has been your favorite crash? Of course, I can't help but enjoy some of the more intense, spectacular crashes. But honestly, my absolute favorite the footage with the two trucks with hay or straw bales stacked on the back. The first one goes through there and shaves off the top layer of straw bales. They fall on the street. The second truck drives through the straw bales and shaves off a layer of straw. I can't help but chuckle. What's the most interesting non-crash you've recorded? 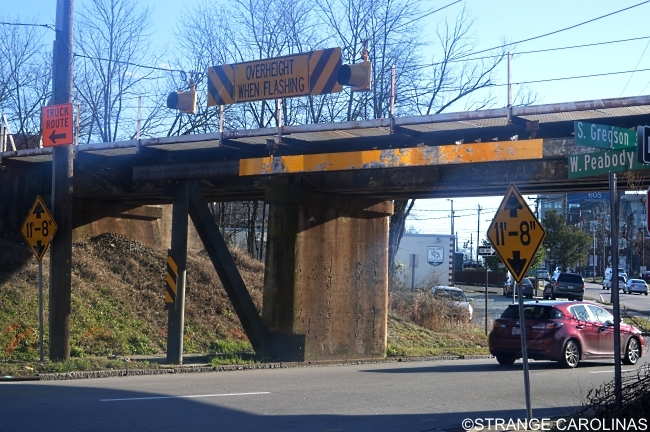 I record everything that goes on at that intersection and there are actually a fair number of car crashes that have nothing to do with the train trestle that I've recorded over the years. I had one recording that gained some interest because it was a hit-and-run. Two cars collided and the one who ignored the sign on Peabody Street hit the car on Gregson and just kept going and left the scene of the accident. With the help of the community, they were able to identify the vehicle and subsequently the driver. When the driver was confronted with the footage, he confessed to the incident. I thought that was kind of nice to help catch a bad guy. Probably my favorite footage, but not a truck crash, are the near-misses, when the truck driver realizes what's going on. I've got some nice footage of trucks stopping in the nick of time in front of the trestle. Tell us about your Crash Art. Frequently after The CanOpener has done its deed and enforced the laws of physics on another over-height truck, there is debris on the road, part of the truck. Once the truck is cleared out of there, I help myself to some of the remains. I figure it's in the public's interest to clean up after this mess. I took them into my office and decorate my office with a few pieces and people have told me they'd be interested in purchasing some. I decided to take some pictures and put them on my website for sale. Well, there's one thing I always like to point out. The crashes, as frequent as they are, are actually exceedingly rare when you look at the amount of traffic that goes through that area. Most truck drivers are careful, they pay attention, they don't hit the bridge. I see two, three, four trucks every day turn onto Peabody Street when the driver realizes that the truck won't fit through there. They turn and take a different route. There's more trucks that notice even earlier and turn onto Main Street. Most truck drivers get it. They pay attention. They take a different route and keep everyone safe. The distracted drivers, the inexperienced drivers, they're the ones that get caught by The CanOpener and they pay the price.